Toddlers are active, busy and love exploring the world around them. Games that focus on early literacy skills can help enhance their language development. 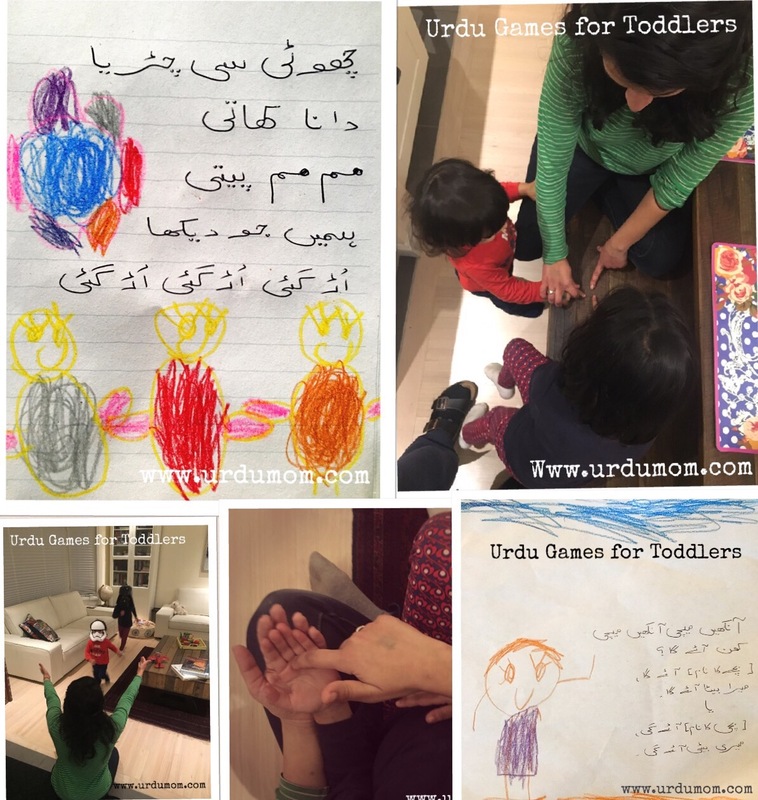 Here are a few Urdu games for toddlers that you can enjoy with them while helping to encourage their Urdu. All games are structured for a bilingual child (urdu/english). Children who speak Hindi can also do these games. This rhyme is similar in action to the english one, “Round and Round the Garden Runs a Teddy Bear”. You can do the english song along with the urdu one to encourage language development in your bilingual child. My dadi (paternal grandmother) would do this rhyme with us as babies and then with my kids. I simply loved it. My husband’s dadi also did the same rhyme with my daughter and it always warmed my heart. This rhyme helps the parent and child bond because the child sits in the parent’s lap as they circle the palm. The finger walk up the arm and tickle is something that all children enjoy. Songs are a great way to encourage vocabulary building. This is a short rhyme so children learn the words quickly and start anticipating the tickle coming. The child rushes to the parent and gives them a tight hug. You can add as many kids as you want to this game. As the child learns the game, you can add the names of their favorite toy, or some inanimate object like “maiz” (table), kursi (chair), etc and see how the child reacts. Some will search for the favorite toy and bring it for a hug. And they will laugh when the parent asks for a “maiz” (table) or kursi (chair). Be creative and have fun with this game. This is another game I remember fondly from my childhood and have continued with my own children. You can do this game in both english and urdu with your children. Do remember though that the urdu version is slightly different for a boy and a girl. This is a great bonding game with an active toddler who loves to run. And who doesn’t love the hugs in the end. You can expand on this song to increase the child’s vocabulary. Since this song has an exact english translation, it really enhances the language skills for the bilingual child. This game is adapted from a beloved english poem “The Moon is Round” and teaches the child the names of the different parts of their face. As in the other games, you can do both english and urdu versions. This is a famous game that I’m sure many south asians will remember from their childhood. You can play this game with one child or many. If a child raises their finger for an object/animal that doesn’t fly, you can playfully give them a tickle and correct them. The same question can be asked for Ghora (horse), Billi (cat), Jahaz (aeroplane), Gaari (car) etc. Add as many words as you want and watch your child’s vocabulary grow. If they don’t know the urdu word of a certain object or animal, this is a great way to teach them. Once you have done a few rounds of this game, maybe the child might want to lead also. Hope you enjoy these games with your bilingual toddlers. I will be compiling a list for older kids too! Let me know what you think! Always love hearing from you. I might make a video soon of these games, would you prefer that over the voice clips? Let me know! دوڑ لگانا وغیرہ وغیرہ ایسے کوئی اور آئیڈیاز please.!!!!!! You’re welcome! Thanks for writing! Stay in touch!